Luke's troop had its Court of Honor this week. This is the awards ceremony for the past six months in scouting. Luke did a great job getting started in scouts. He earned his Scout and Tenderfoot ranks, plus the Space Exploration, American Heritage, Basketry, and Swimming merit badges. He also earned the Totin' Chit which allows him to handle axes and saws, and the Fireman's Chit, which allows him to build fires. That's a great start. I'm especially proud that he's earned the Swimming badge; that's not an easy badge to get. Congratulations Luke! We are very proud of you. 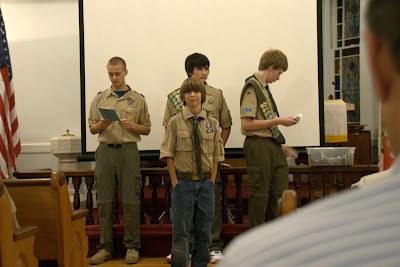 Pretty soon you will look like some of the scouts I remember and looked up to when I was young. These were the guys that wore the merit bad sashes that were covered from shoulder to waste with the many merit badges they had earned. Keep up the good work!